Readers will not need to be told that British culture is now controlled by the liberal-Left, with Luvvies, those wealthy members of the arts elite with fashionable opinions, forming the PR division. Bearing this in mind, it is instructive to compare the 2017 film Dunkirk, just nominated for eight Oscars including Best Picture and Best Director (Christoper Nolan), with the 1958 version which starred John Mills and Richard Attenborough. The new film, which has taken £378million so far at the box office, opens with a title card outlining the crisis in May 1940. The British Army is stranded on the French coast, surrounded by ‘the enemy’. The Germans are not mentioned. Nolan has said this omission was because he ‘didn’t want to get bogged down in the politics of the situation’ and he wanted to ‘make it relevant to young people’. Not to mention making it perfect for the new ultra-PC Oscars. Nolan certainly means business about keeping the Germans out of Dunkirk. By my calculation you see three German planes and one or maybe two German soldiers. Perhaps he will move on to other notable events from the Second World War – the Battle of Britain without the Luftwaffe, Pearl Harbor with no Japanese, the Holocaust with not a Nazi to be seen. The plot has two basic strands. A young British soldier (Fionn Whitehead) survives an ambush and tries to get on a boat out of Dunkirk, and a middle-aged man and his son (Mark Rylance and Tom Glynn-Carney) sail from England with the flotilla of ‘little ships’ to help in the evacuation of the troops. Welcome to Planet Luvvie, where the Second World War is recast as a Corbynist placard, where the British Empire is no different from the Third Reich, and where the Germans are to be pitied because they cannot entirely live down their history. It is a thought worth remembering the next time you wonder how, 73 years after Auschwitz, Germany is the dominant force in the EU. While we are on the EU, Nolan has also said that he sees Dunkirk as ‘a film about European unity’. This statement, as laughable as it is, contradicts another comment he made to explain why he denuded the film of accurate history: Dunkirk, he said, is really just a ‘suspense film’. The movie was being shot when the EU referendum took place. When Kenneth Branagh’s Commander Bolton refuses to leave at the end of the British evacuation he says: ‘I’m staying – for the French.’ Alas! On June 23, 2016, the British voted otherwise. It should have been a triumphant Remainer dog-whistle moment, guaranteed to get Brownie points with Bafta judges and inspire joy in North London cinemas. Now it must have Open Britain enthusiasts crying into their popcorn. In technical terms Ealing Studios’ 1958 version of Dunkirk, directed by the late Barry Norman’s father Leslie, is primitive compared with Nolan’s film, but it carries far more weight in every other way. It assumes its audience will be thoughtful and intelligent enough to be interested in who was fighting whom (there are Germans in this one). Some lines have great force. After German Stukas strafe a line of French refugees, a British soldier yells: ‘That’s murder, that’s sheer bloody murder!’ Another line that would outrage today’s filmmakers is: ‘Refugees hate everybody’. The 1958 Dunkirk leaves you with an impression of bravery, determination, and of a lucky escape. 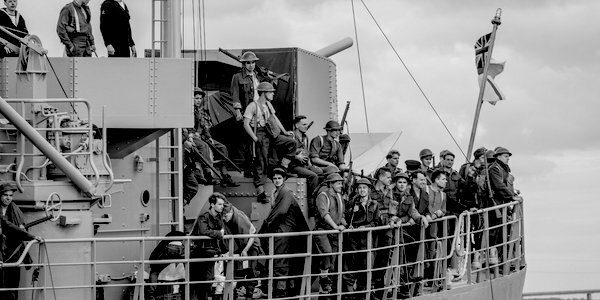 The 2017 Dunkirk finishes with soldiers arriving in Woking on a train. Despite one of them reading out Churchill’s ‘never surrender’ speech from a newspaper, the sense of awe that should be there is missing precisely because of the deliberate lack of nuance and context. Nolan’s take on a legendary episode seems likely to become the way war films are made for the man-bun generation raised on Leftist ideological certainties: If you don’t like what history has to say, simply ignore it.